Congratulations to Bailey Annis of Idaho Falls, the Second District of Idaho's winner of this year's Congressional Art Competition. Congressman Simpson's press release can be found here. 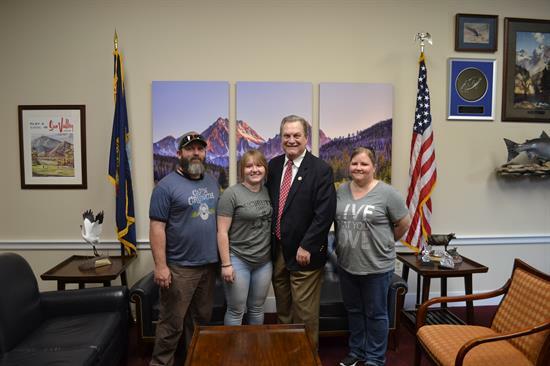 Idaho Congressman Mike Simpson invites high school students across the second congressional district to enter the 2018 High School Congressional Art Competition. 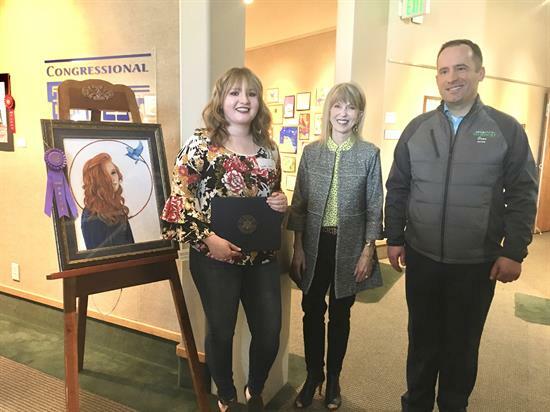 This annual competition encourages Idaho's aspiring student artists to showcase their talents to the public, while recognizing their achievements alongside hundreds of other students and members of Congress from across the country. Since the Artistic Discovery competition began in 1982, more than 650,000 high school students have participated. Students that enter the competition will have a chance to win a round trip flight to Washington D.C. to attend a special reception and see their artwork displayed for one year in the U.S. Capitol Building. One grand-prize winner from Congressman Simpson’s district will be selected during a local reception in March, and will visit Washington D.C. in June. My Heritage. My Future. My Idaho. The United States House of Representatives and the Congressional Institute are the sponsors of this national competition. The grand-prize winner from Idaho will be selected by a panel of artist from the Art Museum of Eastern Idaho, in consultation with Congressman Simpson. The grand prize winner and one guest will fly on Southwest Airlines to Washington D.C. for the unveiling ceremony in June, 2019. Additional awards and recognition will be presented during a local reception for all students who enter. Artists interested in participating must deliver or send their artwork to one of Congressman Simpson’s district offices (see below) before 4:00 p.m. on February 26th. Once artwork is submitted, the Art Museum of Eastern Idaho will commission a panel of experts to jury all submissions. All submitted artwork will be showcased from March 2nd - March 23rd during the Museum’s Young at Art exhibit. The grand-prize winner will be announced during a reception on March 15th in Idaho Falls. Maximum artwork dimensions are 26” high x 26” wide x 4” thick. The grand prize print will be professionally framed at no cost, but should be at least 4” smaller than the maximum dimensions above to allow for a frame. Entries should be matted for hanging. Black or neutral toned matting is suggested. Artwork must be original in concept and design, and may not violate U.S. copyright laws. Only one entry per student. Each student must include a signed release form with their artwork. Artwork can be mailed or submitted in person at any one of Congressman Simpson’s Idaho district offices in Boise, Twin Falls, or Idaho Falls. February 26, 2019 – Student artwork due to Congressman Simpson’s district offices. March 15, 2019 – Student reception and winner notification in Idaho Falls, Idaho. May 2019 – Student artwork returns to schools. May 2019 – Grand prize winner’s artwork sent to Washington D.C.
June 2019 – Congressional Art Competition reception and unveiling in Washington D.C.
June 2020 – Grand prize winner’s artwork returns from Washington D.C.